Break free from the self-help cycle and join the world of successful leaders. The World Is Yours - The Awakening- The Secrets Behind "The Secret"
5.0 out of 5 starsOmg, this is what I've been doing wrong my whole life!! Uh oh! Like the true self-help addict I am, I had to read this the second I saw the summary. Turns out Gefen knows exactly what I've been doing wrong my whole life **facepalm**. 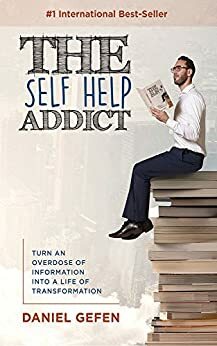 I haven't finished reading it yet, but I've already found myself thinking about plenty of ways I've misused the self help ideas I've learned in the past. This book is NOT a summary of all the stuff you've read before, and NOT a stepping stone to selling more books (or conventions or webinars). Self-contained in a short, 2-3 hour read, here's some real advice for the real world in which we live. 5.0 out of 5 starsOpen and vulnerable. Shares how to turn struggles into triumphs. I discovered Daniel Gefen through his podcast. He's incredibly open and vulnerable. In this book he shares parts of his life authors rarely do. He also shares simple actions you can take to grow as he did. His use of "Addict" isn't bad -- that is, he shows how and why he relates to those parts of him and makes them work *for* him. If you're on a path of improving your life, Gefen will give direction, milestones, laughter, and himself. 5.0 out of 5 starsTips that can be implemented today to become a more profitaleand productive person immediately. I do not read self help books, but a friend recommended Daniel's The Self Help Addict. I was a bit skeptical, but was quickly won over as he shares his early successes and failures that we all can relate to. What really captured my attention was his detail of pitfalls that every driven perfectionist falls into. I saw myself time and time agin as Daniel shared things that would prevent success in any enviroment. His one comment "Good is Good enough" has stuck with me as too many hours have been lost trying to re-work letters, emails and presentations to perfection, when they have been successful in the past. Daniel's book was an easy read and I found myself for the first time actually highlighting areas that will definitely help me to improve my performance. These are actual real life tips that anyone can put in place today and start profiting from them immediately. As a reader who loves self-help and personal growth books, as soon as I read the title, I instantly had to get it. Fortunately, with a Kindle it's as easy done as it's said. This is a truly must book for anyone who wishes to accomplish more than they already have. And that's true for almost everybody who wishes to accomplish. This book, written by someone who has read a lot and has interviewed many successful people is a treasure. The wise learn from everyone. And it's important to realize who we would gain the most from learning from. Napoleon Hill interviewed many successful people and wrote the classic, "Think and Grow Rich." The author is following in his footsteps. I feel that anyone who reads this great book with an attitude of taking action will be super grateful to the amazing author. This book is jam packed with nuggets to apply to your life. I'm a self help addict, so I resonated with this book and look forward to implementing the advice given in this book.